We don’t sell light parasol bases unlike some of the poor quality, ‘blow away in heavy wind,’ efforts you get from some of the major high street retailers today. However, we do realise that not all customers will need 30kg plus in weight and that’s why we sell this little beauty which is heavy enough to keep lighter parasols sturdy and upright but easily portable at the same time. 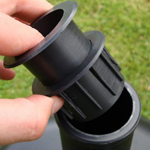 The heavy-duty handles sit flat in the base when not in use and the plastic tube can be unscrewed for easy storage. The shiny finish makes the whole thing maintenance-free as well. If you have further enquiries please call our Showroom in the Midlands.